Popular for outdoor weddings and spring special occasions this better brand crisp poly-rayon 5-piece short set in a popular color of pistachio green is fresh and unique. 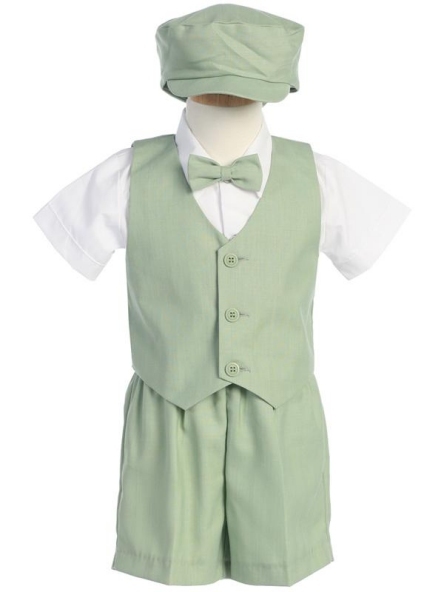 Lined vest, elastic waist shorts, clip-on bow tie, cabbie hat, and poly cotton short sleeve dress shirt. Shirt is machine washable, dry cleaning is recommended for the vest and shorts. US made from Lito. Check the General Size Chart for Knicker Sets, Shorts Sets and Eton Suits and choose carefully. - Special occasion clothes run small.